The Chinese space program made history on January 2 as its Chang’e-4 spacecraft successfully soft-landed on the far side of the moon. While photographed several times over the years, no other country has soft-landed on the far side. 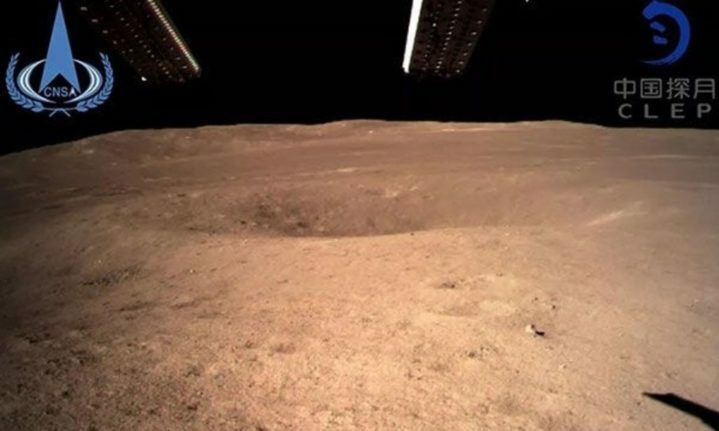 Landing at 9:26 p.m. Eastern Standard Time, the Chang’e-4 lander touched down within the Von Kármán crater, which is 115 miles (186 kilometers) in diameter. Located with the South Pole‐Aitken (SPA) basin, the crater is part of what is considered the largest impact structure in the solar system. Studying the Von Kármán, the China National Space Administration (CNSA) hopes, will offer further insight into the moon’s origins. The landing site will also give scientists a better understanding of the moon’s radiation. In a press release, the CNSA announced that Chang’e-4 has already been sending pictures back to Earth with the help of a relay satellite. Since the far side of the moon never faces the Earth due to the home planet’s tidal forces, such a satellite is needed for a successful landing. Named Queqiao (after a “Magpie bridge” from Chinese mythology where lovers from the physical and spiritual worlds meet), the satellite has been orbiting the lunar region since June 2018. The Chang’e-4 mission has international components as well. Comprised of a lander and a rover, the mission’s eight scientific instruments include two jointly designed by Chinese scientists and their counterparts in Sweden and Germany. Chang’e-4, whose name comes a mythological goddess who lives on the moon with her pet rabbit, represents another step forward for the CNSA’s ambitions. In 2013, the country became just the third in history to soft-land (as opposed to a hard-landing, a crash) on the lunar surface at all, joining America and the Soviet Union. “Gaining confidence in far side landings opens ‘the other continent’ for full exploration and sample return, and to a treasure trove of scientific targets and fundamental scientific results. Chang’e-4 is a total game-changer in terms of gaining access to ‘Luna Incognita’ and is akin to Columbus’ voyages to the New World,” said James Head, a planetary scientist at Brown University in Providence, Rhode Island, speaking to SpaceNews late last year. The far side landing is a lynch pin for future Chang’e missions, which are planned well into the 2020s. The country’s ambitions on the lunar surface are large—eventually, China hopes that Chang’e 7 will be able to detect icy water deposits on the far side to help set up a lunar research base. But for now, it has a dark side to explore.